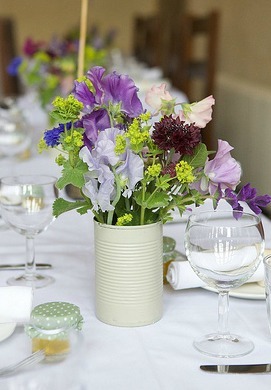 Cheap Wedding Centerpiece Vases - Where Can You Buy Them? Wedding centerpiece vases are the perfect base for many centerpiece ideas and they don't have to be used just for flowers! Vases are great for displaying branches, peacock feathers, twigs, floating candles, pebbles – anything really, although looking at that list you would need more decoration than just a twig! Unless it was a very beautiful twig from a branch of the tree that you were engaged under and even then you would probably have to have a note explaining why it was there! Vases can be beautiful, perfect and very expensive which when you are planning a cheap wedding you want everything as cheap as possible without compromising on the quality. and you can choose to have your items delivered to your local Dollar Tree for collection for free. Simple and clear, square or rectangle shaped vases are possibly the cheapest vase you would find for your cheap centerpiece. You can buy these at IKEA, dollar stores, Walmart, Ebay and many cheap home stores. Try grouping different height vases in the middle of the table, or keep it simple with a single flower head in each vase, hydrangeas, Gerber daisies and roses all look stunning. You can hot glue ribbons in your wedding colors around the middle and fill with pebbles and a floating candle. Round, clear vases that look just like the old fashioned goldfish bowl are a popular contemporary centerpiece, you could fill these with candy and favors, or you could use the vase to create the flower arrangement. Your flowers could be arranged traditionally with the flower heads above the water or you could have the flowers and leaves arranged under the water. Tall wedding centerpiece vases are great if you have a large reception room as they give height and provide decoration at another level. Eiffel tower vases are great to use for height and you can get these in various heights, they can be as tall as 32", or as short as 8". When you have tall wedding centerpieces you may want to think about having decorations closer to the table, glass votive and petals scattered on the table work well as then your guests have something to look at while they are seated and they are cheap! Eiffel tower vases can be expensive, to find them cheaper you will need to hunt around, look out for the sales, check out wholesale florist suppliers, online auctions and one of the best places is to look in the free ads and wedding forums for brides that are selling their wedding stuff after their wedding. What else are you going to do with 12 identical vases? You may want to give some as gifts if you don't want to sell. If you are having a vintage wedding theme then take a look at the vintage glass that you can find at local thrift and consignment stores, it doesn't have to be just vases, you could use wine glasses and bowls. Don't panic if they don't match, that is part of the charm and you can bring them together with flowers and candles. You don't just have to use proper vases for your centerpieces, be practical and look at using jam jars, mason jars and empty wine bottles. The jar in the photo was an old pickle jar and I have stuck on a piece of lace. The flowers even came from my garden so this is probably one of the cheapest centerpieces I have ever made! One couple drank only a particular brand of water coming up to their wedding as they wanted the blue bottles for their centerpieces, they looked great with a single lemon rose in each of the 3 bottles on each table. 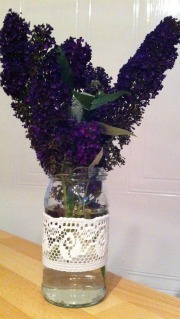 Making your own vase out of things you already have is a really great way to save money and it can look stylish. Just look at the this beautiful centerpiece and then look very carefully at the vase - do you think you may have some of those lying around at home? A tin can sprayed with white paint looks fab. If you can't find the ones that you want to buy, you may want to look at hiring them. The overall cost for the vases could end up cheaper although you won't have any vases to take home. If you are having a florist create your centerpieces then you may be able to keep the costs down by providing your own vases rather than using their own. 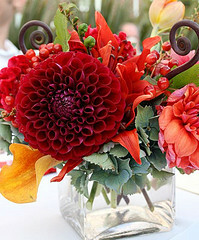 Before you buy all of your vases make up a trial centerpiece to ensure you are happy with the result.